His drunken invective was not released into a vacuum. The National Front had recently won around 40% of the vote in Blackburn. Racist attacks were on the rise. The intervention of fascist ideas into mainstream politics seemed a real possibility. Significant numbers of the population were being seduced by the Far Right and the violent solutions they offered to economic and social ills. An ugly mood pervaded the country. It was against this background that a number of people – Red Saunders amongst them – decided to act. Following Clapton’s drunken outburst, a letter appeared in a number of publications, the Melody Maker and NME included. 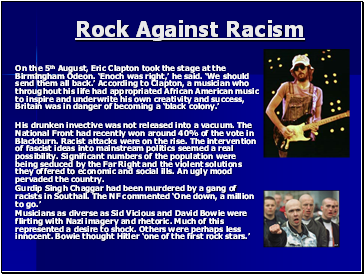 It was a call to arms against fascism and racism, a public riposte to Clapton’s bigotry. 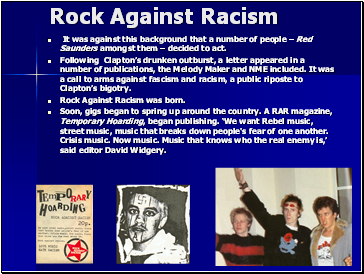 Rock Against Racism was born. Soon, gigs began to spring up around the country. A RAR magazine, Temporary Hoarding, began publishing. ‘We want Rebel music, street music, music that breaks down people's fear of one another. Crisis music. Now music. Music that knows who the real enemy is,’ said editor David Widgery. As momentum began to build, a concert was planned for Victoria Park on 30th April 1978. The Clash were to headline, and in the tradition of the RAR gigs up until that time, a line-up reflecting the diversity of the UK was booked. Punk, reggae and everything in between was represented. 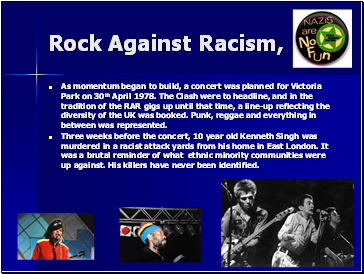 Three weeks before the concert, 10 year old Kenneth Singh was murdered in a racist attack yards from his home in East London. It was a brutal reminder of what ethnic minority communities were up against. His killers have never been identified. 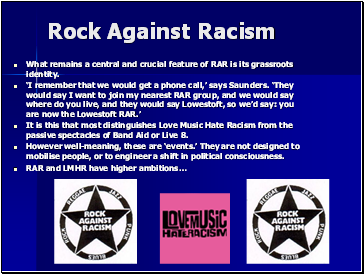 What remains a central and crucial feature of RAR is its grassroots identity.